At Mb Inc., it is imperative that corporate excellence goes hand in hand with a high degree of corporate social responsibility, and this is achieved through what is known as the Y.E.S. (Youth & Society; Education; and Sports) categorization. 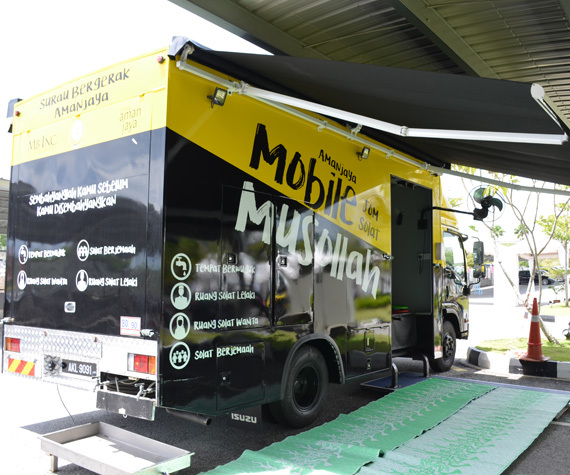 The Mobile Musolla is a specially modified vehicle that enables Muslims to perform prayers in comfort during outdoor events when prayer spaces are not available. It is one of our forms of charity and contribution to the implementation of youth-friendly da’wah. Mobile Musollah service is open to all members of the public and it will be on the road when the need arises. A driver and a religious officer will double up as Imam and bilal to perform the Azan on the site.